Currently playing with the Sisters of Swing; click here for the band’s gig listing. 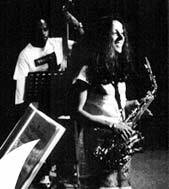 Each year, Jackie plays with her Bristol student group at the Blowout Sax Student Gig in Bath. Here are YouTube videos of 2 of her groups performing at the Blowout Gigs. Over the years, Jackie has played in a wide range of gigs and venues including pubs, private functions, street parties and festivals.